Springpad has updated their Android client, adding in new ways to share your notes and memos, as well as new widget options. Springpad is a popular cross platform service, that stores and sorts your notes and reminders in the cloud, making them easily to access from any Android or iOS device, or your computer desktop. What makes Springpad unique is the way it gathers other pertinent information from the web about the item your saving. New in the latest version is what Springpad is calling "Save for later" from other apps. Anything you can long press you'll be able to save to Springpad, and their service will fill in details like directions, prices, deals and the like, and attach them to your item. Of course it handles simple note-taking as well, and does so like a champ. 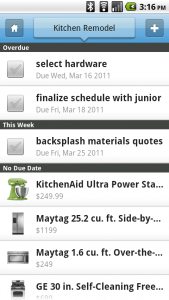 Add in a quick note style widget, and a to-do list widget, and it all works really well. 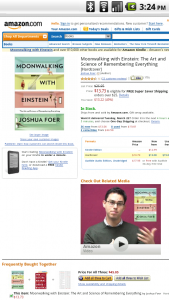 Sounds like it may be very useful, and well worth a look. 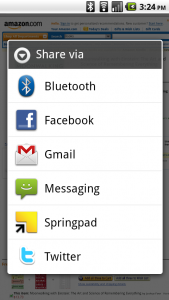 Springpad is free on the Android Market for phones running Android 1.6 or higher. The download link, press release and some more screenshots are after the break. Boston, MA—March 22, 2011— Today Springpad, the “smart” note application that makes it easy to save anything you want to remember, released a new version of its Android app. The improved app provides new ways for users to easily save information from mobile apps and Websites directly into Springpad, which then automatically enhances what they save with useful and relevant news, alerts and offers. This enhanced content is automatically and dynamically updated as new information becomes available. · Save for later from other apps – A feature that makes it easy to save information from other apps and Websites and automatically adds relevant and timely news, alerts and offers. For example, when a user saves a restaurant from the Yelp app to Springpad, he will automatically get other helpful information about that restaurant including menu pages, alerts to deals of the day, directions to the restaurant, links to reservations, etc. · Save It Widget – A configurable widget that lets users instantly save what’s most important to them directly from the Android home screen. Users can customize the specific add options they use the most, such as audio, tasks, movies or photos. 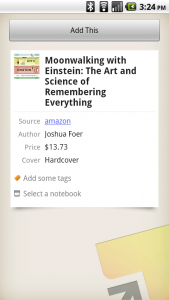 · List It Widget – A customizable widget that lets users access what they’ve saved that’s most important to them. For instance, users can choose to have access to incomplete tasks, recent alerts or flagged items. · User requested enhancements – Features that include more ways to customize sorting, ordering, navigation, display and organization of what users have saved to Springpad. With more than one million users, Springpad is providing a smarter way to save and organize anything users want to remember across platforms and borders. So far, more than 12 million items have been saved by users. Once items are saved to Springpad, users can remember, organize and take action on everything from lists to recipes, to places they want to go, to products they want to buy, helping them make more efficient use of their time and money. Springpad is available for iPhones, iPads, Android devices and the Web. To learn more or download Springpad, visit http://springpadit.com. Springpad is a lifestyle application that helps you make better decisions tomorrow by actively remembering what you save today. Created by Boston-based Spring Partners and available for the iPhone, iPad, Android or on the Web, Springpad helps you remember anything, anytime, anywhere, for free. TIME Magazine named Springpad one of the 50 Best Websites of 2010 as well as a Top 10 iPhone App of 2010.